Shopping bags can save you from stock piles of plastic grocery bags and are big enough for all the items you gather when you’re out and about. The outside has a rough texture and the insides are laminated with a clear PVC coating to make them water resistant. With a variety of sizes to choose from, there’s a perfect bag for every errand. 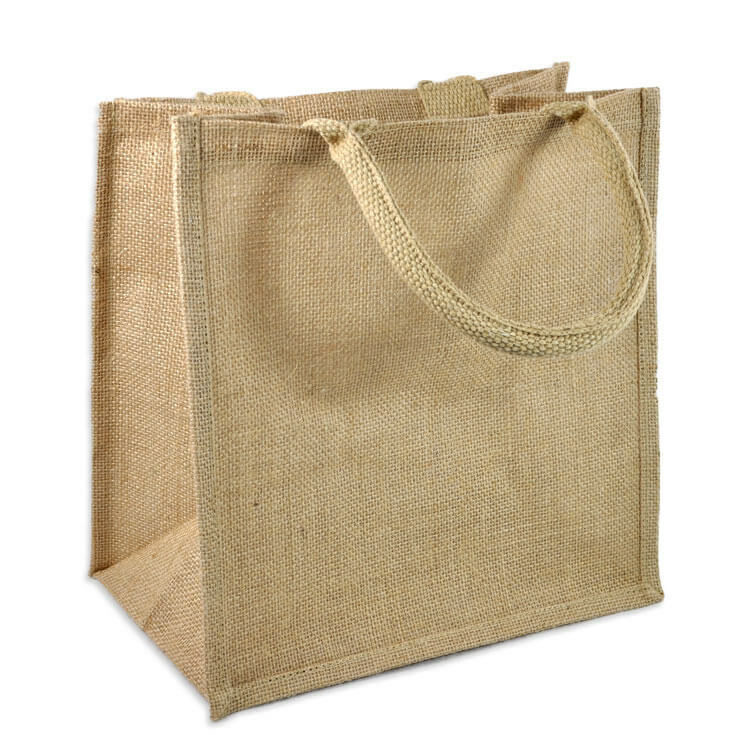 These shopping bags are available in 100% jute with cotton handles, or a 50/50 blend of jute and cotton. These bags are also popular for gift bags, welcome bags, and favor bags. You can personalize them with stenciling or other embellishments. The natural color jute shopping tote bags come in 3 sizes: 15.5″ x 13.75″ x 6″, 12″ x 12″ x 7.75″ and 9″ x 11″ x 4″. These tote bags are great for gift bags, welcome bags, and favor bags, particularly for rustic weddings and events. The large size is often used as reusable grocery bags. The 100% jute burlap fabric has comfortable cotton handles and a protective coating on the inside, making it sturdy and durable. The neutral burlap makes a good base for embellishing as well. The jute shopping tote bags come in navy blue and are also available in the 15.5″ x 13.75″ x 6″, 12″ x 12″ x 7.75″, and 9″ x 11″ x 4″sizes. The blue color of the burlap is unique and is particularly popular for beach wedding favor bags. The 12″ x 12″ x 7.75″ Jute Blend Shopping Tote Bag is 50% jute and 50% cotton, which makes it feel softer than burlap while still having a rustic, natural look. It’s also a good base for stenciling or other personalization. Click here to see our shopping bags! Are these products available in Canada ? BEST ANSWER: Yes, we ship to Canada! Do vinyl decals adhere to the burlap shopping bags?